Makua and I were snuggling up at the Rell Sunn benefit on the North Shore at the Turtle Bay Resort. He's a champion surfer, born and raised in my neighborhood, who's competing in the surfing contests here this winter. Last I saw him, he was nursing an injury after a hairy ride in the Eddie a couple of years ago. He had to run off because he was called to the stage to play music for the event. 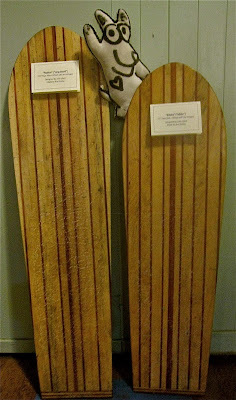 Rell Sunn, a competitive surfer, was born on the West Side of Oahu in Makaha and was the epitome of the "Aloha Spirit". She loved life, the ocean, and giving back! Also known affectionately as the Queen of Makaha, Rell was the first female lifeguard in Hawaii. Her daughter, Jan, established an educational foundation after her mom passed away. I was at the annual benefit and loved the music and comaraderie. Tom Curren has been one of the most admired and famous surfers in the world for thirty years. He's not competing anymore, but playing music, and surfing for fun. 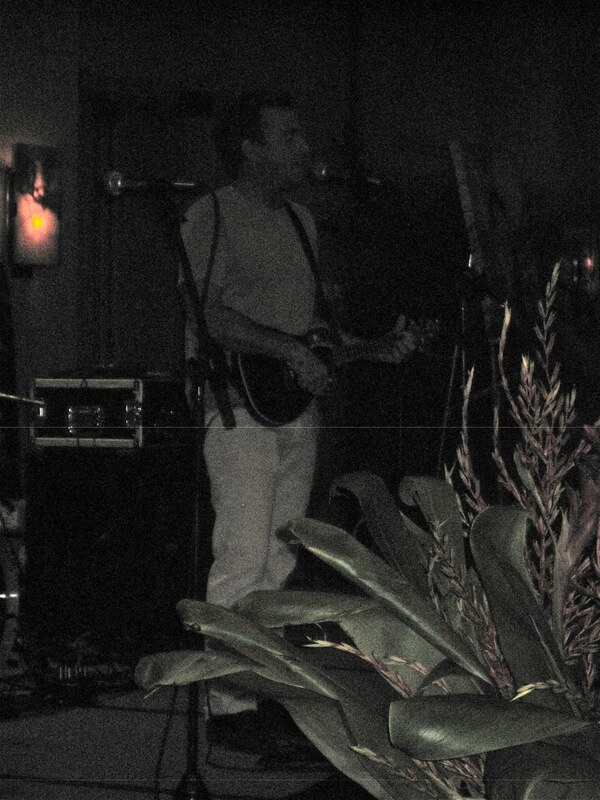 He contributed his aloha to the Rell Sunn benefit and wowed the audience with his vocals. Well, Mom woke me up before dark on Black Friday and we headed to Honolulu to check out the shopping scene at Ala Moana Center. 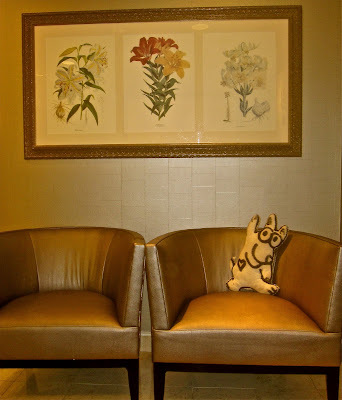 This is definately the best restroom in the mall-----at Neiman Marcus. And it's just around the corner from their cafe which serves delicious sandwiches and soups. Should you ever be at Ala Moana, I recommend it! When hunting for gifts, one of my favorite stores in Ala Moana is Papyrus. 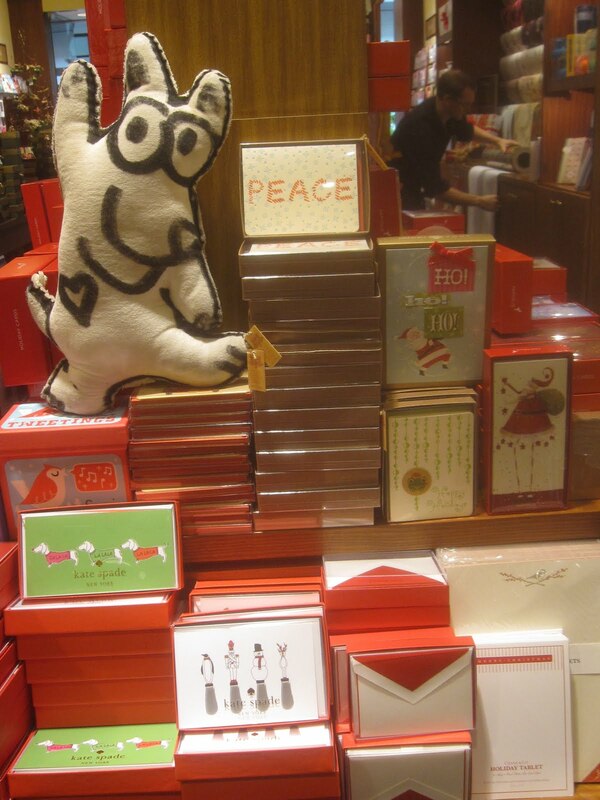 It a stationery shop with the most beautiful note cards, wrapping paper, ribbon, calendars, and so much more. Stop by! Following are a two photos from the store. Cards, cards, and more cards; I bet you can find whatever you need at this lovely little stationery shop in Ala Moana Shopping Center. Stop in Papyrus and tell them Rex sent you! L'Occitane (loxy ton) is Mom's favorite store in Ala Moana and we just had to come here on Black Friday to see what was offered. 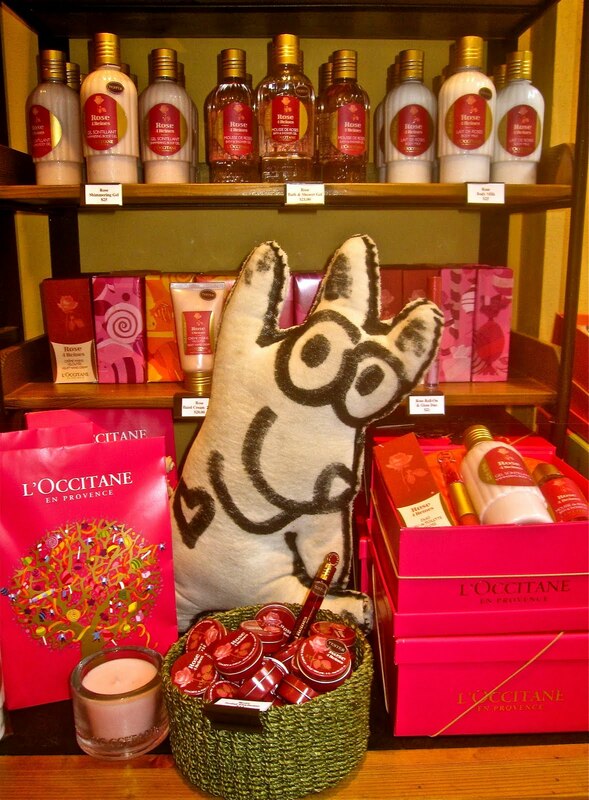 The body products come from France and are heavenly. This shop is a perfect place to buy a gift for anyone you want to make feel special. The latest research shows the healthy benefits from inhaling Mother Nature's plant essences, especially lavender. I strongly suggest you give this store, or any other L'Occitane across the U.S., a visit. This is Dunie. Can you see he is a ribbon dispenser? 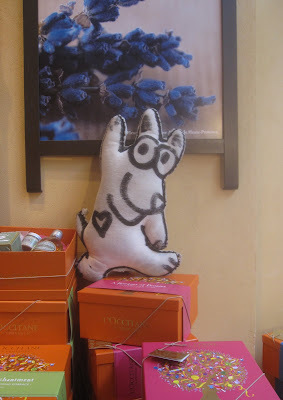 One of the clever salegirls in the L'Occitane store made him. I just loved his bright colors and functionality! He'll have a partner soon, Birk. Rose is the scent Mom likes the best! Stop into this little bath and beauty shop in Ala Moana, or somewhere else around the world, and see what you think. 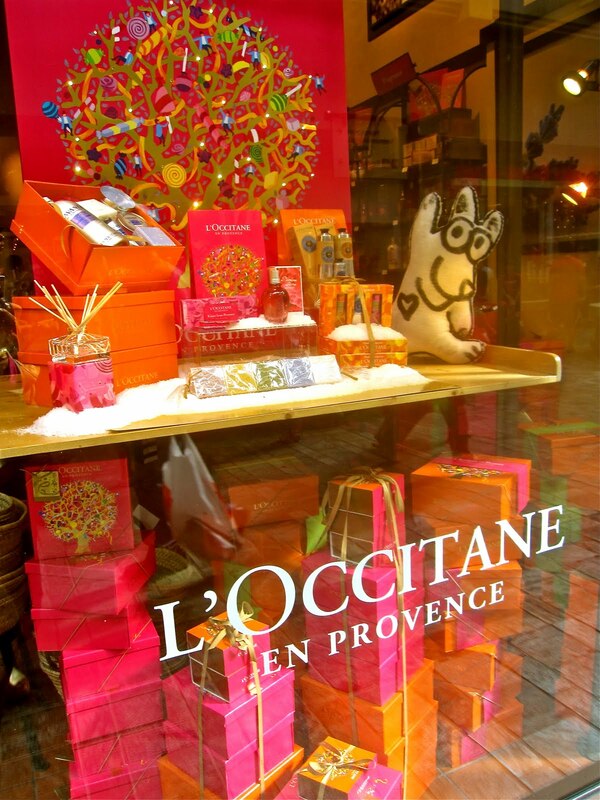 L'Occitane will be on your list of favorites too, I am sure! I was at the Williams-Sonoma store on the upper floor of Ala Moana and came across this baking tin. Now, I know the secret to great gingerbread cookies-------triple the spices and let the dough age for about three weeks before you roll it out and cut the cookies. Williams-Sonoma has a great recipe in their Holiday Cookie recipe book. Another secret, and this one's healthy, use whole wheat pastry flour instead of enriched flour. I can smell the cinnamon, cloves, and nutmeg in the air right now! Williams-Sonoma has just about anything you could want in the kitchen for cooking, baking, roasting, poaching, prepping, icing, cutting, chopping, serving.......I could go on and on. 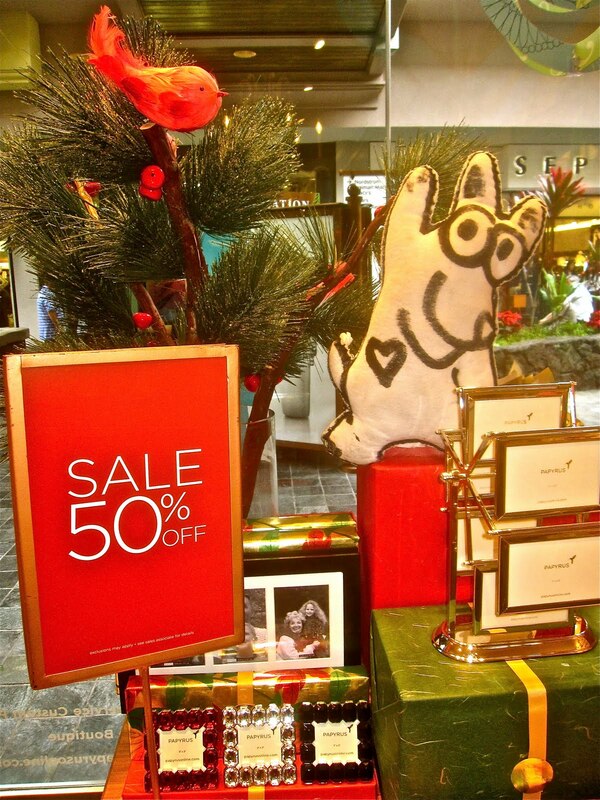 Stop by the store at Ala Moana and see for yourself. You know, of course, that dog's can't eat chocolate, so be very careful that none fall into the jaws of your canine this holiday season. 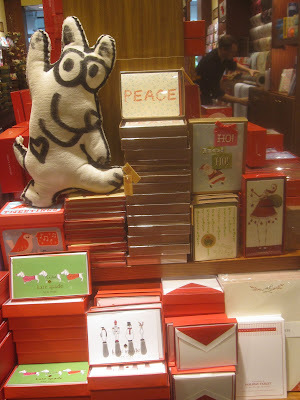 But, if you feel like giving a box for a treat to an adult or child, See's is the place to shop. What Mom loves best about this store is that you can select the chocolates you want to fill a box and they are super fresh. She always goes for the dark chocolate nuts and chews. The nougats are her favorites. She eats just dark chocolate and says that she's "taking medicine". Hum.......but, you know, the science is behind her! Dark chocolate equals medicine, but not tooooooo much. Another secret-----you always get a free chocolate just for stepping into See's! 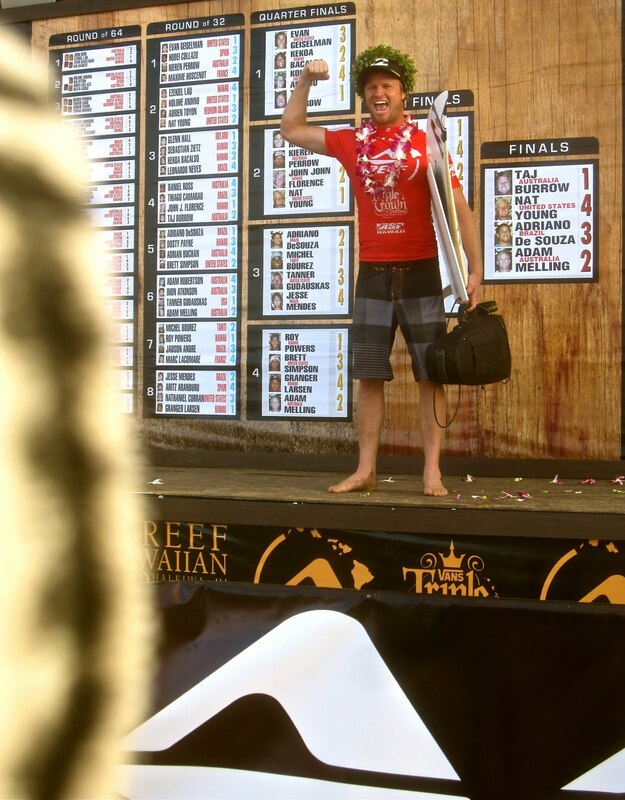 Taj Burrow won the 2011 Reef Hawaiian Pro Surfing Contest. It's the first of three contests in the Van's Triple Crown of Surfing. This is the 15th year Taj has been competing professionally. He's always one of the frontrunners, winning contests across the globe. His parents are American and moved to Yallingup, Western Austrailia, several years before he was born. We'll be looking for him at the Sunset contest starting Friday, November 25, surf permitting, of course! Shea Lopez, from Daytona Beach, Florida, is one of the three main announcers for the Reef Hawaiian Pro, the first contest of the Triple Crown of Surfing. A former professional surfer, Shea was one of the top 16 surfers in the world for eight years. He likes this job because he travels across the globe and is still a major player in the surfing world. Listen to him broadcast at all three Triple Crown events. There is so much to do to prepare for the Triple Crown---planning is a team effort. David, holding me, is the cameraman who shoots everything, but the waves. Chris is an associate producer whose job is to solve the hundreds of little problems which arise daily. Now, that's a mighty big job, if you ask me! 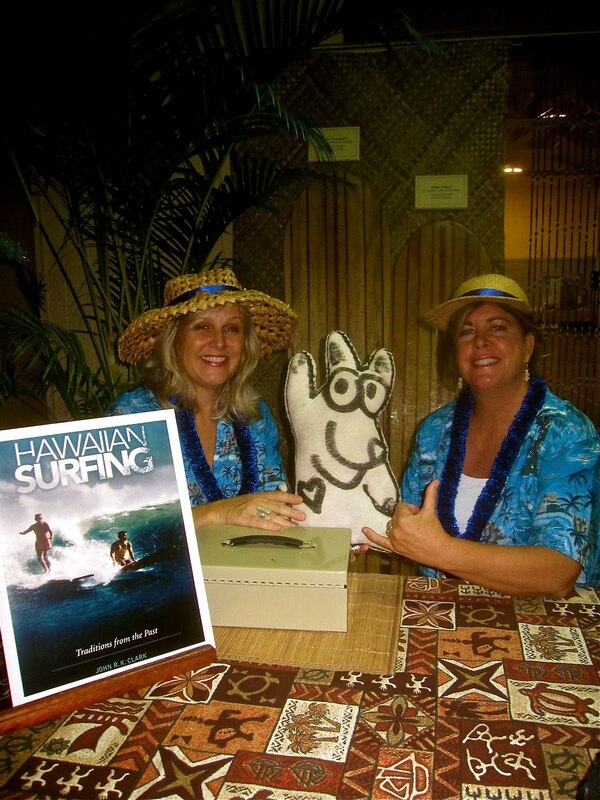 It's takes collaboration and diplomacy to make this grand surfing contest happen! 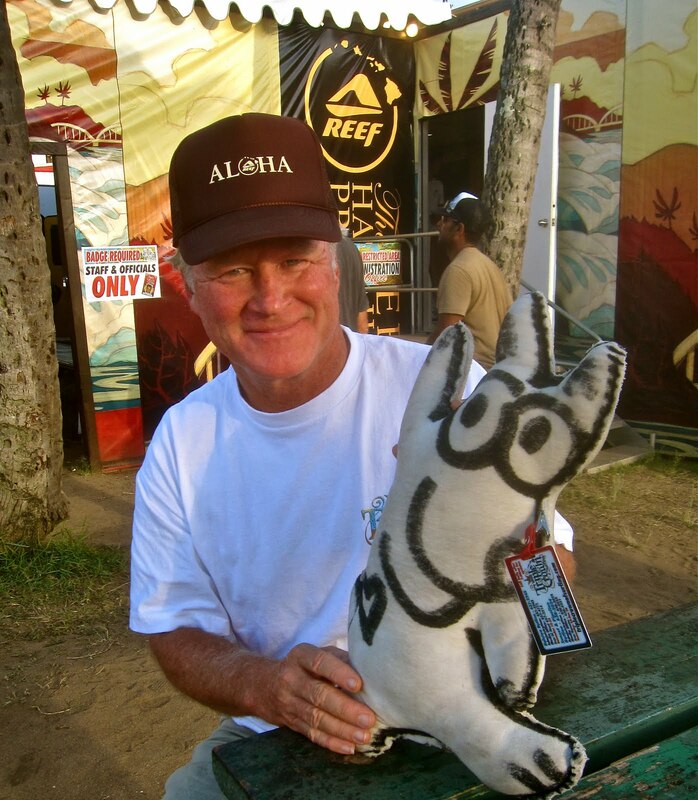 Randy has been in charge of the Triple Crown of Surfing for many, many years. A former professional surfer, he still shapes surfboards, travels the world looking for waves, and puts this contest on every year. He's a strong supporter of the community and is very generous to organizations in the neighborhood like Sunset Beach Elementary, Mom's school. Bravo, Randy, we appreciate all you do! 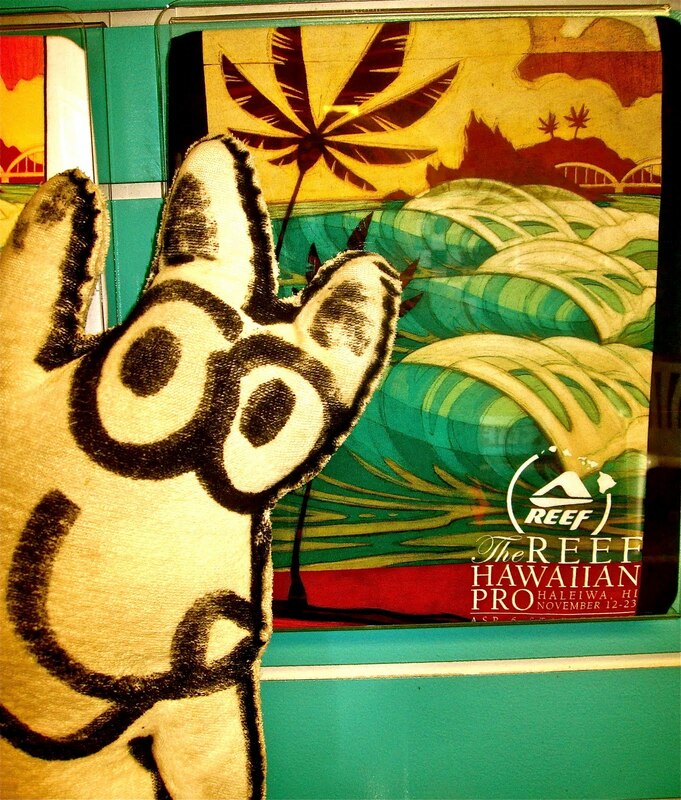 The Reef Hawaiian Pro ends tomorrow, November 23. Stop by the event in Haleiwa at Ali'i Beach Park. Watch the greatest surfers in the world compete. You'll have fun and be in awe! Promise. 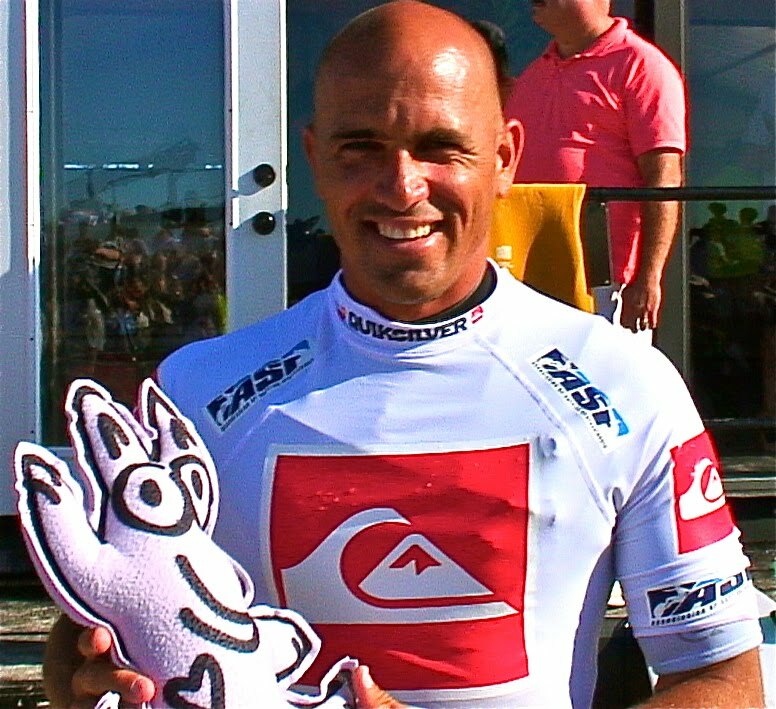 Go to www.aspworldtour.com for details and the schedule for the next two surfing competitions. 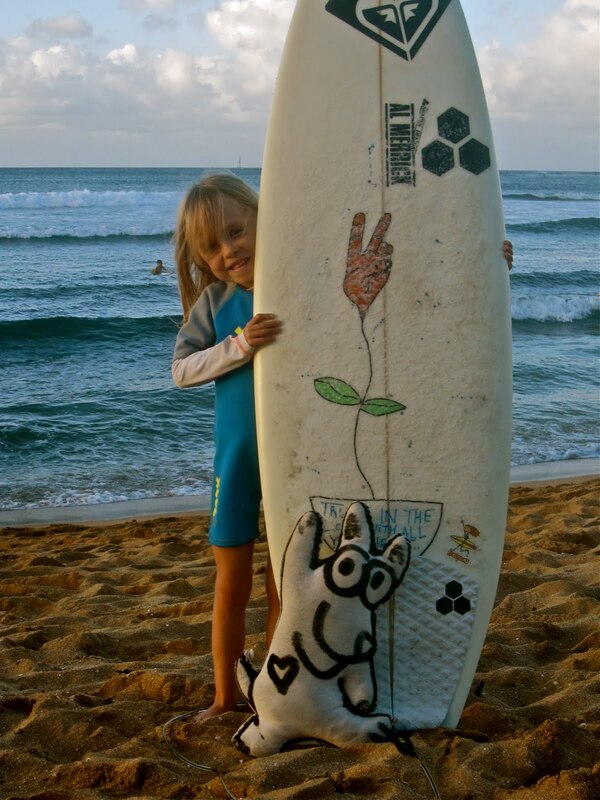 Lily is an avid surfer. She stands up and charges the waves as brave as brave can be. I'm impressed! The inside waves at Ali'i Beach Park are perfect for her. No waves. No surf contest. I'm in Haleiwa at Ali'i Beach Park biding my time until the surf comes up. 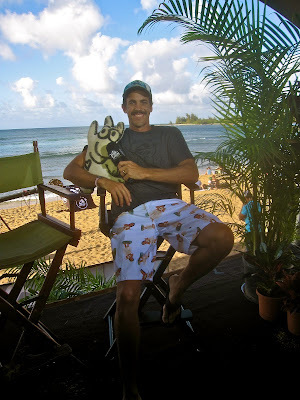 The Reef Hawaiian Pro is the first of the last three contests of the ASP (Association of Surfing Professionals) World Tour. The holding period started on November 12 and still no waves and it's been a week. I'm looking toward the horizon-----looking for lines-----hoping for surf! The beach had a few tourists, and a few children were out in the water, but no waves in sight. Booooooo. Maybe I should make up some kind of "surf chant/dance" to bring on the waves. Any suggestions? 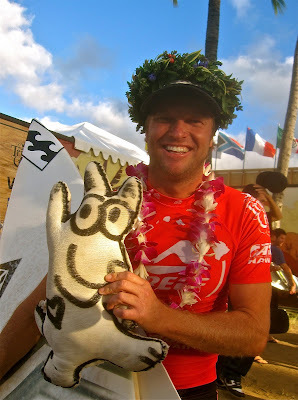 Well, the Triple Crown of Surfing is three contests and the last competitions of the 2011 ASP World Tour. It's a huge media event that will be live streamed around the world, therefore, big equipment is needed to record all the activity, in and out of the water. Under this silver tarp is a giant camera with a boom. This is Jim Lucas and he's the Chief Engineer of the Triple Crown. 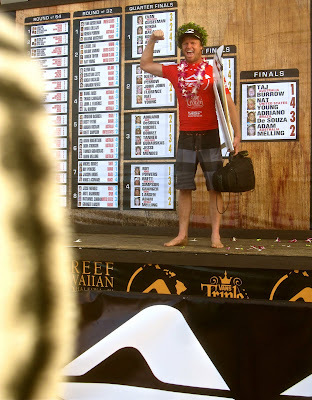 Over the next six weeks, he'll make sure that all the cameras and everything else is working properly to get the surf contests to you anywhere in the world. He's done Super Bowls and World Series! Yikes, that's a lot of responsibility! You'll see what I mean in the following three photographs! His equipment is mindboggling for my little doggie brain! This is where the director of the television coverage sits during the contest. He can see everything even though he's tucked behind the judge's stand in a little trailer. I have on my headset because everyone who's involved in the production wears one. This is Jim's room, the engineering room. He sits here during the contest and makes sure that all the cameras, there can be as many as ten, are showing the same color no matter which one is on the action. Whew--I think that job must be a little nerve wracking. A chief engineer has to be very focused---no fooling around! This is the trailer named TV 1 which houses all the electronic equipment to televise the surf contest across the globe. It was built by Jim and he maintains it. This rolling production, audio, and engineering vehicle will stay in Hawaii and be used for other sporting events. It's getting ready to move to Sunset Beach in a couple of days for the second to last surfing contest of the 2011 ASP World Tour. Let's all think WAVES. It's pretty disheartening to the competitors, organizers, and spectators on hold for the Reef Hawaiian Pro for so long, just waiting and waiting with no waves in sight! Again, tune into www.aspworldtour.com to be updated. 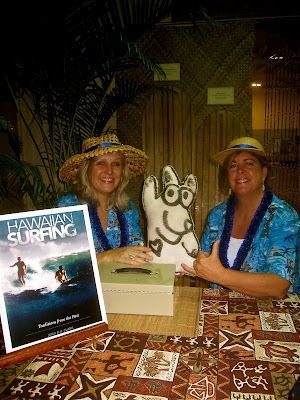 Vera and Gidget (giving me the "Shaka" sign) greeted me at the Waialua Community Center for a night of fun and education. Sponsored by the North Shore Chamber of Commerce, the residents of the community were honored with a slide presentation of the beginnings of surf riding in Hawaii. Did you notice the old fashioned paipo boards behind them? 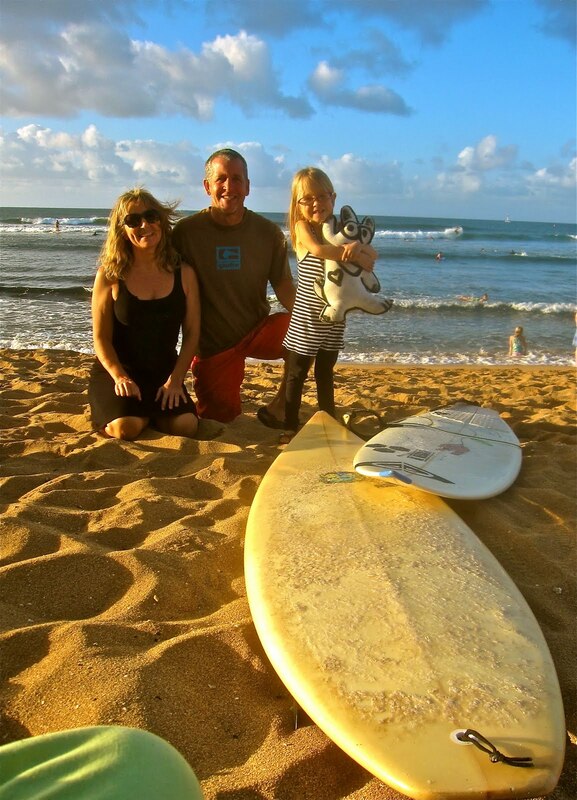 This is John R. K. Clark, a retired fireman and surfer. He probably knows more about the beginning of wave riding in Hawaii than anyone else. He's published 8 books and was signing his latest, HAWAIIAN SURFING--Traditions of the Past, when I met him at the community center. 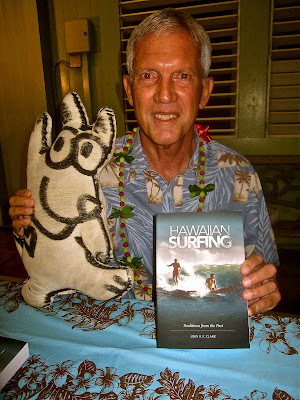 He researched the first Hawaiian language newspapers on Oahu, had them translated, and uncovered many interesting facts about surfing-----waves were ridden six different ways. Want to know more, lots more, go University Press http://www.uhpress.hawaii.edu/ and google his book. Better yet, buy it and educate yourself. It's a great reference book. 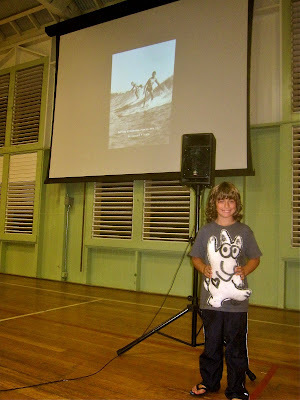 Kula, one of Mom's former students, was at John Clark's presentation with his mom and dad (a surfer, of course). Don't you just love the old fashioned screen and louvered windows? The gentle trade winds blew in as we sat back and listened to stories, and looked at images of the early days of surfing----up until 1954. That's when everything changed---foam boards were introduced to the sport! Randy Rarick, Executive Director of the Van's Triple Crown of Surfing, introduced John Clark to the audience. 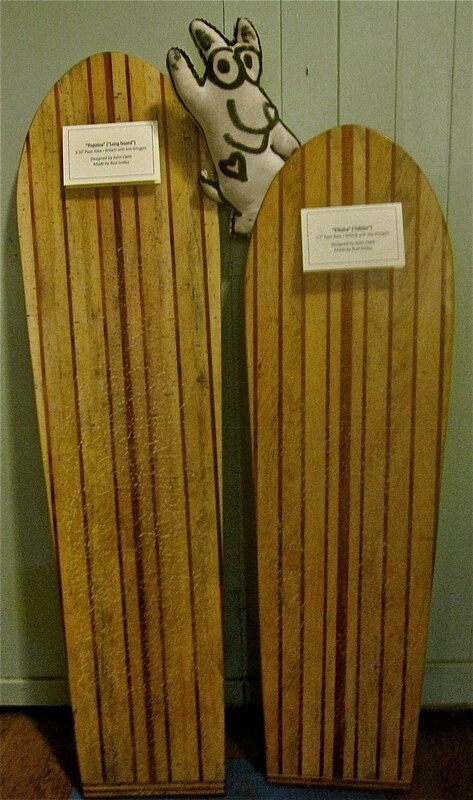 Randy and "Johnny" have been surfing together for many years; they go way back. 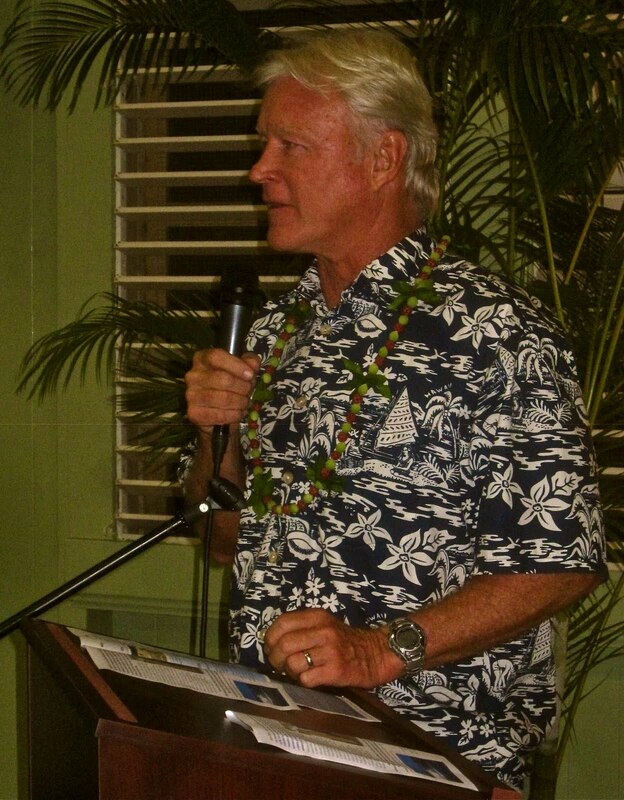 Randy told the crowd that this event and John's new book, HAWAIIAN SURFING, were the perfect way to commence this season's big surfing waves and competition! I agree! Kelly Slater, 39 year old surfer from Florida, won his 11th world surfing title on November 2, 2011. Bravo to a great role model and extrodinary athlete. 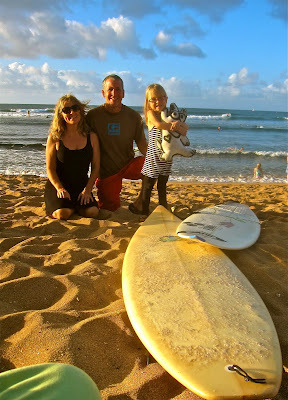 We in the surfing community on the North Shore are extra proud of you!! We'll be awaiting your arrival for the Triple Crown starting on November 12th.